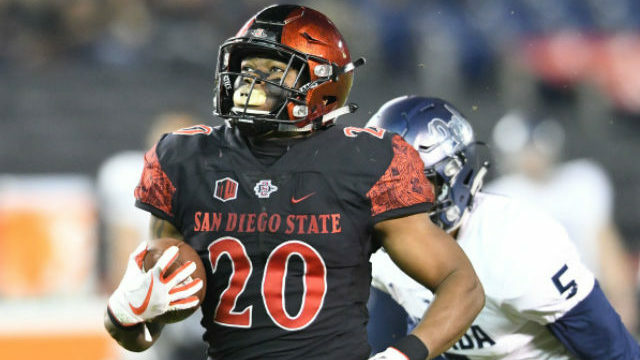 San Diego State University running back Rashaad Penny was named to the Associated Press All-America first team Monday. Penny, a senior from Norwalk High in Los Angeles County, led the country with 2,027 rushing yards, 2,698 all-purpose yards and 168.9 rushing yards per game. He scored 19 rushing touchdowns while averaging 7.4 yards per carry. He also caught two touchdown passes, returned two kickoffs for touchdowns and returned one of his two punt returns for a 70-yard touchdown. The AP All-America selection is one of the highest honors in college football and adds to a growing list of awards for Penny, who finished fifth for the Heisman Trophy, the award given to college football’s top player. Penny also became the first player to win two conference player-of-the-year awards last week when he was named the Mountain West Conference’s Offensive Player of the Year and Special Teams Player of the year. Stanford’s Bryce Love, who was second in the nation with 1,973 rushing yards, was the other first team All-America running back selected by a panel of 17 media members from around the country. Penny’s first team selection to the AP All-America list — typically considered the most prestigious list of its kind — provided some redemption to the Aztec coaching staff, players and fans who felt Penny was snubbed for personal awards like the Heisman Trophy or the Doak Walker Award, which is given to the nation’s top running back. Penny did not even make the three- player shortlist for the Doak Walker Award. He was named a finalist for the 2017 Walter Camp Player-of-the-Year award. Joining Penny as an AP All-America selection was Utah State senior cornerback Jalen Davis, a graduate of Helix High School in La Mesa. Davis was a second-team AP All-America selection. 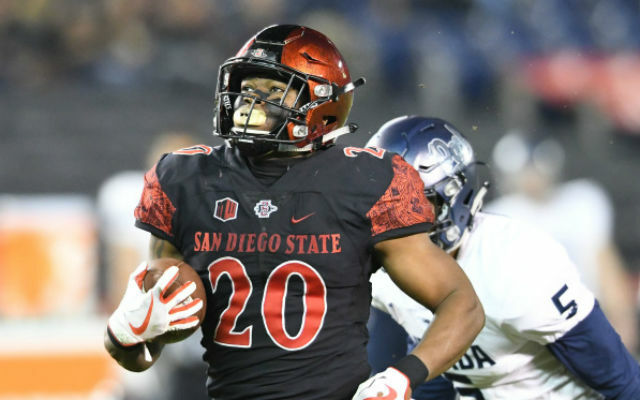 Penny and the Aztecs will take on Army in the Lockheed Martin Armed Forces Bowl in Fort Worth, Texas, on Dec. 23.